AP ECET Syllabus 2019: Jawaharlal Nehru Technological University Anantapur is a conducting body of AP ECET. Andhra Pradesh Engineering Common Entrance Test (AP ECET) is a state level exam held once in a year to offer admissions to the second year of B.E./B. Tech/B. Pharmacy courses in the state universities and colleges. Candidates who wish to appear in this exam must aware the syllabus and exam pattern to get qualify. The official notification will be issued soon. Before that we advise the candidates to start preparation to score high in the exam. We have brought the complete syllabus and exam pattern of AP ECET 2019. Candidates can check the full article and download the syllabus. Without a proper plan candidates don’t score high in the exam. So, aspirants must aware all the topics which will appear in the exam and schedule your preparation in a better way. Look at the below table for brief view of AP ECET 2019. Nationality: Student should belong to the Indian National and a domicile of Andhra Pradesh state. Applicant must have completed Diploma in B.Tech/ Pharmacy from the State Board of Technical Education of AP. Students of B. Sc Mathematics can also eligible to apply this exam. The Application cost is Rs.400. Candidates can pay the application fee through Credit/Debit Cards/Net Banking. The AP ECET 2019 exam will be conducted in online mode (CBT). It is an objective type of multiple choice question paper. The question paper will includes total 200 multiple choice questions. The whole exam carries 200 marks for all courses. The exam will be allotted 3 hours of time to complete. 98.37% Candidates were passed in AP ECET 2018. AP ECET results 2018: Andhra Pradesh Engineering Common Entrance Test 2018 results are declared today. AP ECET examination was conducted on behalf of APSCHE by JNTU, ANANTHAPUR. Students who have attended for the AP ECET can download the results now. The AP ECET results 2018 are available on the websitw-www.sche.ap.gov.in. The candidates who have qualified in the AP ECET examination can get the admission into second year of regular courses. AP Engineering Common Entrance Test Examinations was conducted by the JNTU, Anantapur. The AP ECET exam was conducted on May 3rd 2018. AP ECET exam is a computer-based examination. The results of AP ECET are declared today. 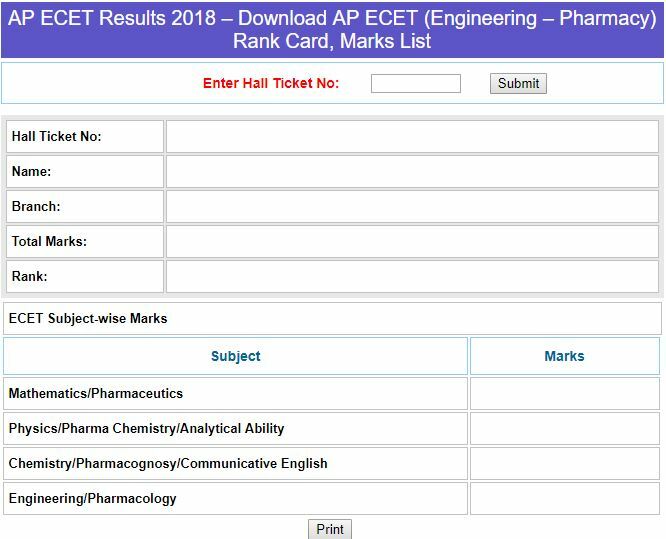 Candidates can download the AP ECET rank card, the scorecard on sche.ap.gov.in and also other websites namely-carrers360.com, indiaresults.in Etc..,. Nearly 33000 have attended the exam. The results will be available in online only. Candidates who wrote the exam can download the answer key on the website. Qualified students can get the admission into the second year of regular courses. After the AP ECET results are announced in a few days counseling starts from the first week of June 2018. Only qualified students are allowed for the AP ECET counseling.